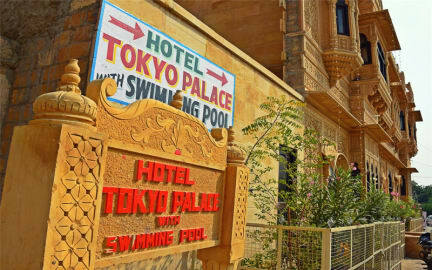 When you travel to Jaisalmer, stay with us at Tokyo Palace. 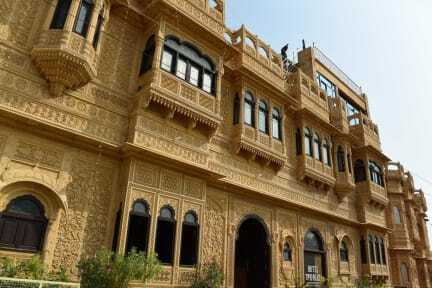 We are a friendly, family run hotel in the beautiful and historic city of Jaisalmer. On a quiet residential street but a short walk from the fort, palace and famous haveli's of the city. We can also arrange a camel safari into the Thar Desert, which we highly recommend as a wonderful and unique experience. Our hotel has a swimming pool and a roof-top restaurant & terrace with views of the Jaisalmer Fort. We have Standard Rooms, Deluxe Rooms and Suites. Dorm beds are also available. All of our rooms have a full range of modern conveniences including flat screen TVs, air conditioning and up-to-date bathrooms. They are decorated in elegant Rajasthani style with ornate stonework and colourful fabrics. Our hotel services include free WiFi, Internet, tour information (including sightseeing and camel & jeep safaris), laundry service, currency exchange, transportation advice with your flights, trains and buses and complimentary transfers to/from the train/bus station. Very nice hotel with beautiful spacious rooms. Roof top terrace has nice views on the fort. Location convenient, in walking distance to the fort and new old town. Hotel staff/manager is very nice. They picked us up at the train station and allowed us to leave luggage in the hotel, take a shower and shuttle us back to the train station after our safari even so we did not book the safari with them. Breakfast was not included but the breakfast at the rooftop terrace was very good! Greeted with a smile and hot drink on arrival these guys really make a difference and go the extra mile. Super accommodating and helpful. Not a hostel vibe while I was there because it was quite quiet but I didn’t mind because it was the perfect place to have a warm shower in a clean bathroom and rest my head on a clean pillow in a more than satisfactory dorm room. Thanks again you guys! IT HAS A POOL 😍 apart from that it is quite average, it’s clean and within walking distance from the beautiful fort. I did a desert safari which the hostel organized and it was awesome! I really enjoyed my stay here. The restaurant upstairs had good food and a very nice view of the fort and the city, and the rooms were kept nice and cold which was good to escape the heat. The staff was helpful and not too pushy when selling the desert Safari trip. I would stay here again. They have a fantastic roof top restaurant with a great view of the fort and very fast WiFi. An okay location with a 10 minute walk to entrance of fort. Staff were helpful with booking trains and buses. I was in a 10 bed dorm, hard beds and it is located in the basement it of the way.